The WR34 Series Overhead Frame Wheel Rakes come in 14-, 16-, 17-, and 19-wheel options with raking widths of up to 34-feet 6-inches. The WR34 Series offers a 12-foot 5-inch transport width for your convenience. WR34 Series rakes offer maximum maneuverability to work every area of your land. Plus, they handle crop gently to minimize crop damage and leaf loss. 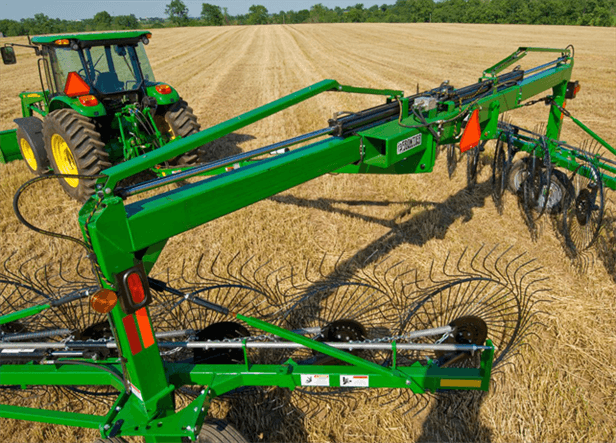 Best of all, we've replaced the center kicker wheel with an optional three-wheel expansion for full-width raking.